premiered January 2015 at Adelaide Fringe in Australia. 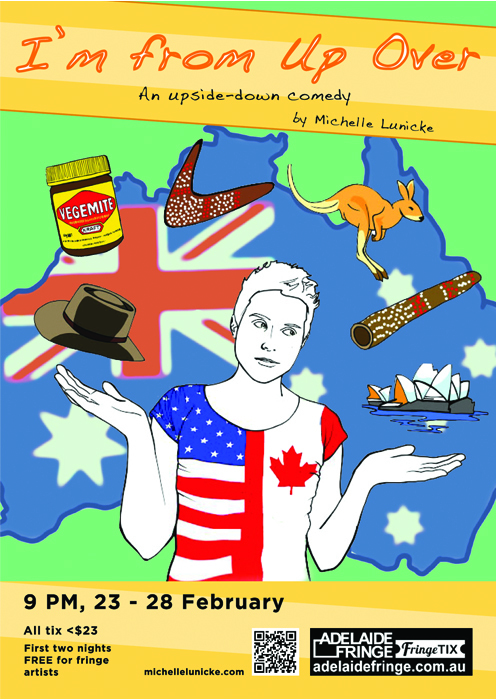 I’M FROM UP OVER is a one-person comedic show cataloging a speed-through of my experiences in Australia as a foreigner from one of the least traveled populations, North America. Begun from my arrival with an ambitious goal of understanding another post-colonial, multicultural society, it follows my journey across the country gathering experiences and stories, both my own and others. It uses humor and insight to peel back the layers of Australian identity…and in the process, my own. Built for an Australian audience, but with a nod and a wink to my home culture in the Pacific Northwest, I’M FROM UP OVER is intended to bring Australia and North America a little closer to understanding through humor and grace, that we’re all in the same boat. As a note for my blog followers: Some of the stories from the show are here on the website, and some are not. This website was an unpacking place, and was definitely a foundation for the play. But more than this is the pages and pages of journals I have kept faithfully even when I had no internet connection for months on end, and the thousands of photos, audio, and video I took with the hopes of finding a story. I found that story, and like all good stories, it had twists and turns I was not expecting. It landed me in a place I couldn’t have predicted, and I was thrilled to be able to share that story with you in an original, creative, and funny way. Some shows are life-long joys, others capture perfectly a moment in time, and afterwards are nearly impossible to access. I’m afraid IfUO is one of the latter. After spending nearly two years in Australia and New Zealand, my ideas have changed, my ignorance has changed, and my accent has changed somewhat too. I am no longer the confused Ameri-nadian. I am something else altogether, and altogether wonderful. This show has helped me launch myself and now I move on to other things. This page includes a few photos from I’m from Up Over. I started a crowd-funding campaign to help me buy color posters and flyers in the months before the festival. The campaign ended January 31, 2015, less than a month before my show opened. When people think of crowd-funding, they think of invisible hands and generous strangers, but the truth is that if you are reading this, you ARE the network. Not someone you think might have more resources than you and is in a better position to help…YOU. Like most artists I need a primary audience, people who will help me make art and enjoy its outcome. The hands are yours. Many people were very generous and I could not have done this project without them. Here is a list of those who wished to be named (contact me with corrections), and there were many more who wished to remain anonymous. This list does not include the many people who supported my show in other ways, with time, opinions, cash in envelopes, coffee, kind words. You know who you are and hopefully how grateful I am to you. A lot of these people are also amazing creatives, healers, and entrepreneurs in their own right. Support them!